James opening the letter to his community speaks about the inner conflicts and temptations that can influence our response to trials. He speaks of persevering in temptation and that temptation does not come from God. James is not writing to say we should overcome sinful impulses by our own effort. Rather, he advises Christians to quiet themselves, to listen, to humbly welcome the Word that has the power to save us. 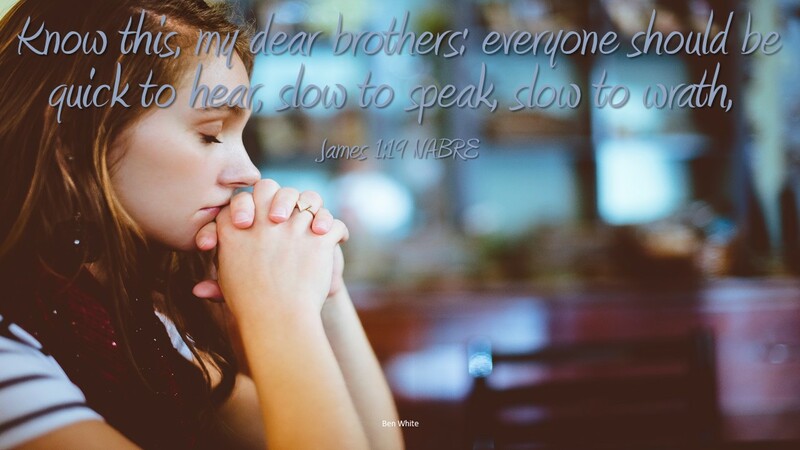 James teaches to be quick to hear, slow to speak and slow to wrath. To be quick to hear first is to be quick to hear the Word of God. Secondly, to humbly hear and listen to anyone. Failure to listen can lead to misunderstandings. Sometimes, just listening can bring healing and restoration. In combination with humble listening, we should be slow to speak, indicating a willingness to learn and to not jump to conclusions. We recall Proverbs 17:28 “Even fools, keeping silent, are considered wise.” James exhorts not to act in anger, anger does not demonstrate the righteousness, or justice of God. We might think anger is justified at times, but it doesn’t usually bring the kind of just result God is working toward. God wants us to bring about righteousness through humbly accepting His word and following His commands. By listening to others we bring the presence of God in their lives. At a time when they might need healing they will think of us and remember our humble listening. When it comes to listening, even the Dali Lama teaches that when we speak we are not learning anything we don’t already know, by listening we learn. Finally, acting in anger only pushes people away. We should always consider how we are being received when we act on what we believe. Do you listen humbly? Do people consider you a good listener?